A major theme in the end time prophecies of Daniel is the Antichrist and his demonic rule. Daniel could be called the prophet of the Antichrist because he supplies us with more information about this tyrant than any other prophet, including John in the book of Revelation. Further insights into the Antichrist's character and methods can be found in chapter 8 where Daniel begins to focus on him by presenting a series of symbolic types of the Antichrist. The first was a ram with two horns, one longer than the other (verses 3-4). The angel Gabriel reveals to Daniel that this ram represents the Medo-Persian Empire (verse 20). The "longer horn" would thus represent the man who came to dominate this kingdom — namely, Darius the Great. The two qualities that Daniel emphasizes about this man are his strong will and his ego, as manifested in his doing as he pleases and magnifying himself in the process (verse 4). Daniel next sees a male goat with "a conspicuous horn" between its eyes. This goat moves quickly and attacks the ram, destroying him immediately (verses 5-7). Again, Gabriel explains to Daniel that the male goat represents the Greek Empire which will overthrow the Medo-Persian Empire (verse 21). 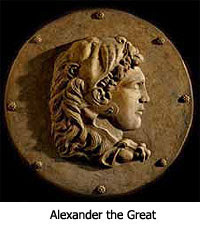 The "conspicuous horn" was, of course, symbolic of Alexander the Great. Daniel's description of the Greek Empire puts the emphasis on the power of its army and the swiftness of its victories. This corresponds to the fact that we are told in Revelation that the Antichrist will conquer the whole world in three and a half years. Another thing emphasized by Daniel is the ego of the conspicuous horn. We are told that he "magnifies himself exceedingly" (verse 8). Verse 9 of chapter 8 brings us to the third of the symbolic types of the Antichrist. Reverting to the terminology of chapter 7, Daniel calls this individual "the little horn." He says he will rise out of one of the four divisions of Alexander's kingdom and that he will move toward "the Beautiful Land," which is Israel. This person proved to be a Greek tyrant who arose to dominate the Seleucid area of Alexander's empire, an area that included Syria and Israel. His name was Antiochus. He was a mad man who considered himself to be divine. He gave himself the title, "Antiochus Epiphanes," which meant "Antiochus the Manifested God." 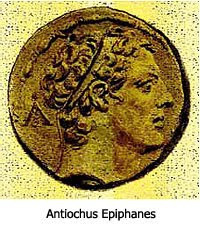 The Jews nick-named him "Antiochus Epimanes," meaning "Antiochus the Madman"! It was a title he well deserved. Let's look first at the prophecy and then the historical record. In Daniel 8:9-12 we are told that the "little horn" will trample down the Jews, blaspheme God, violate the Jewish Temple, and stop the sacrifices. Daniel even tells us how long the desecration of the Temple will last: "For 2,300 evenings and mornings; then the holy place will be properly restored" (verse 14). This most likely meant that the sacrificial system would be suspended for a total of 1,150 days since there were two sacrifices per day, one in the morning and the other in the evening (Exodus 29:38-43). "When [Antiochus] came to hear of what had happened, he concluded that Judea was in revolt. He therefore marched from Egypt, raging like a wild beast, and began by storming the city. He then ordered his soldiers to cut down without mercy everyone they encountered, and to butcher all who took refuge in their houses. It was a massacre of young and old, a slaughter of women and children, a butchery of virgins and infants. There were eighty thousand victims in the course of those three days, forty thousand dying by violence and as many again being sold into slavery. Not satisfied with this, he had the audacity to enter the holiest Temple in the entire world... With his unclean hands he seized the sacred vessels; and his impious hands swept away what other kings had presented for the advancement, the glory and the honor of the place." The atrocities of this mad man are spelled out in even greater detail in 1 Maccabees 1:23-67. There we are told that he stripped the Temple of everything — all its silver, gold and precious vessels — "leaving the place a shambles." He then once again proceeded to defile the Temple. He "erected the abomination of desolation" above the altar. This was a statue of the Greek god, Zeus. The passage in 1 Maccabees gives the exact date when Antiochus desecrated the Temple by erecting the statue of Zeus: "On the fifteenth day of Chislev in the year one hundred and forty five." This converts to December 8, 168 BC. We are told later in Maccabees that the Temple was cleansed and the altar restored by Judas Maccabees on Chislev 25 in 165 BC, representing a period of 1,150 days, exactly as prophesied in Daniel 8:14 (1 Maccabees 4:52). So, Daniel asks the Lord for an explanation of the vision (verse 15). In response, the Lord sends the angel Gabriel who tells him that the vision "pertains to the time of the end" (verse 17). He emphasizes this again in verse 19 where he tells Daniel that the vision relates to "the final period of the indignation" (the Great Tribulation) and that it "pertains to the appointed time of the end." The next reference to the Antichrist is found in chapter 9 in Daniel's prophecy of the 70 weeks of years (9:24-27). Daniel is told that a decree will be issued to rebuild Jerusalem and that 69 weeks of years later (483 years) the Messiah will be "cut off" and Jerusalem will be destroyed again. However, once more we are assured that the Antichrist himself will be destroyed in the process. Daniel is told that destruction will be "poured out on the one who makes desolate" (verse 27). Once more, Antiochus Epiphanes is presented as the classic type of the Antichrist (verses 21-35). He is characterized as despicable, deceptive, a man of intrigue, and a person whose heart is set against God. He is also presented as a warrior who will conquer and plunder and who will ultimately desecrate the Jewish Temple by stopping the sacrifices and erecting an "abomination of desolation." "Then [in the 'end time' (verse 35)] the king will do as he pleases, and he will exalt and magnify himself above every god, and will speak monstrous things against the God of gods; and he will prosper until the indignation [the Tribulation] is finished..."
We are told that the Antichrist will invade the "Beautiful Land" (Israel) and that he will be attacked by the "king of the South" and the "king of the North" (most likely Egypt and Syria). He will conquer all the nations of the Middle East except Jordan, which he will be prevented from entering (most likely because the Jewish remnant will be hiding there). He will proceed to Egypt in order to plunder its riches. But "rumors from the East and from the North" will disturb him (possibly armies from Russia and the Far East that are revolting against him). He will retreat to the area "between the seas" (the Valley of Armageddon) to await the arrival of these armies. It is in this valley that he will "come to his end" (Daniel 11:45, Joel 3:9-17, and Revelation 19:14-21). This whole section of Scripture could be called the "Campaign of Armageddon" because it leads the Antichrist to that valley where he and his armies will suffer total defeat in an instant when Messiah Jesus returns and speaks a supernatural word of destruction (Zechariah 14:12 and 2 Thessalonians 2:8). Concerning our response to Joel Richardson's theory about the Antichrist being a Muslim, see this article The Antichrist: Will he be a Muslim?